Recently I was in the kitchen making dinner, waiting for company to arrive. The sun was coming in at just the right angle for where I was standing, that I was able to clearly see the disgusting amount of dust that had accumulated on top of the light fixture that hangs over the dining room table. Not a light dusting of dirt and grime, no. It was a thick layer, and to top it off, there was more than one dead bug that had met it’s unfortunate demise inside the fixture. After the horror of the bug cemetery inside of the light fixture, I set out to look more closely at our home for places that needed some attention that I’d forgotten about or overlooked. Here’s the list I’ve come up with, but if you think of something to add, send me an email so I can go clean it! The front of the fridge. It’s an area that’s easy to overlook, because usually if we’re staring at the fridge, the door is open. But things have a way of dripping down/splashing onto the front of the fridge. It deserves a regular wipe down. The handle of the fridge and dishwasher. While you’re wiping the front of the fridge, make sure to get the handle, too. And pay particular attention to the handle of the dishwasher. We grab it when loading dirty stuff in there, so it’s bound to be covered with gross stuff, even if you can’t see it. Doorknobs. Another place that we touch all the time. We touch the door handle, wash our hands, then touch the door handle again. It seems reasonable to wipe those down every once in a while. Banisters and hand rails. Just like doorknobs, we have our hands all over these and they rarely get cleaned. Not only that, but they can get dusty, too. TV remotes. Every single person in the house touches these with their grubby little hands. Taking a disinfecting wipe to them every now and then is a good idea. Light fixtures. I know, I already mentioned it. But for real, go take a look at the light fixtures in your house, inside and outside. No wonder my house gets dusty almost immediately after I’m done cleaning. It’s falling off of the light fixtures! Under the bed and behind furniture. It’s a little shocking when you decide to rearrange your house, and find all of the dirt and fuzz that’s been avoiding your vacuum cleaner this whole time. It was lurking at the edge of the wall underneath your bed! The inside of the dishwasher. I know, the dishwasher cleans itself every time you run it. But it actually doesn’t hurt to take a look in there every once in a while, as food can get stuck at the bottom, in the silverware rack, etc. Your purse. I’m not talking about the inside of your purse. (Which yes, needs to be cleaned too. I swear, if I throw away all of the gum wrappers in there, my purse is about 5 pounds lighter.) The actual purse itself needs to be cleaned every so often, too. Think about where you put that thing. The floor of your car, the counter at the coffee shop, then a chair in the waiting room at the doctors office, then into a public restroom, and finally onto your kitchen table. You wouldn’t put your shoes up there, so maybe think twice about the bottom of your purse, too! Reusable Grocery Bags. They ride around on the floor of your car. Then they sit in the shopping cart. Then they get loaded up with a milk carton that has milk on the bottom of it, a tomato that got a little squished, and a package of raw chicken. That’s your food you put in there people. It’s hard to remember to wash them because at least for me, they spend most of the time in my car. But if you really think about it, they deserve a good cleaning on a regular basis. Steering wheel. This can get overlooked while you’re cleaning out your car because it doesn’t look dirty. But as with a lot of other items on the list, your hands are all over it. During cold and flu season you go out, touch the door handle at the grocery store, the key pad of the credit card machine, and then your steering wheel. Wouldn’t hurt to wipe it down here and there. Light switches. While I was hunting around the house for dirty places I was overlooking, I noticed that a couple of our light switch plates were actually really dirty! Like, enough so that they left visible dirt on the rag I was using to clean them with. Gross! Your cell phone. Is there anything we touch more often than our cell phones? Unfortunately, probably not. Those things go with us every where, including the bathroom sometimes. (Admit it, you do it, too.) This means they seriously need to get cleaned though, like, every. day. 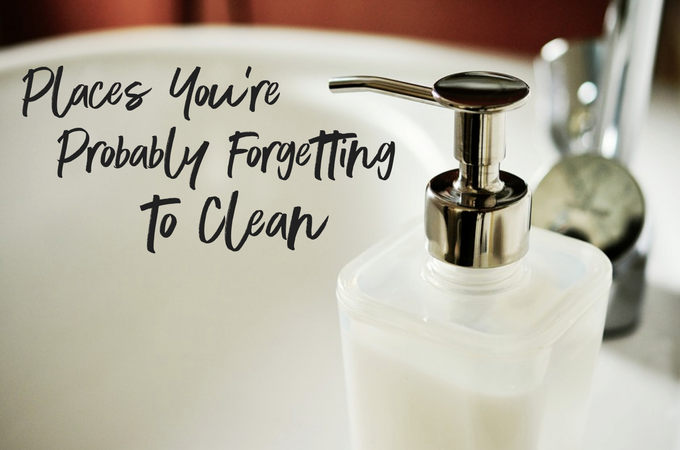 I’m serious, let me know what areas of your home you’ve forgotten to clean! I’m on a quest now!